It’s the middle of August, and it hasn’t stopped raining for weeks. No roofer will come near my leaking skylight. 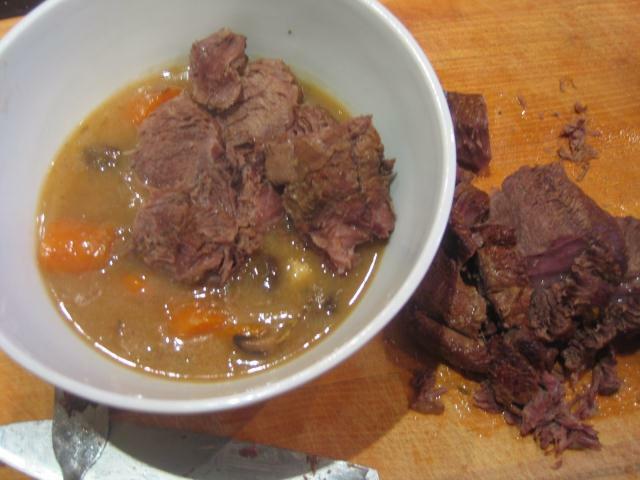 Against this backdrop, a dinner of brisket and root vegetables doesn’t seem too out-of-place, so I threw together a mediocre piece of brisket from the forgotten depths of the freezer with carrots, onions and mushrooms in some vegetable stock with a bit of thyme and a couple of bay leaves. Nothing fancy, nothing complicated, no particular recipe involved. And yet, as is customary, I still manage to foul it up by neglecting to add flour to the vegetables to thicken the stock. This happens every single time. This time, I recovered well, sneaking some flour in the form of a flour/stock paste. With some vigorous stirring, it nearly all dissolved. Nobody noticed.